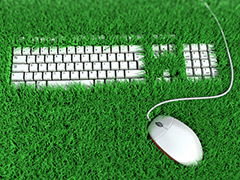 Going green is easier said than done...especially for businesses. There are few things more frustrating than insincere environmentalism, and action is where it’s at, so here are a number of ways for big and small businesses alike to make power-saving a reality within the workplace. First of all, let’s talk surroundings. Perhaps you’ve heard the old adage that everything in life is about location, location, location. Well, that certainly rings true here, and in more ways than one. Hiring an eco-friendly landscaper to give the business exterior a makeover supports green building initiatives, increases civic beauty and puts employees in a meditative and productive state of mind during lunch breaks and informal meetings. The utility bills associated with heating and/or cooling a building account for a large percentage of operation costs and inefficiency in the workplace. Plus, the average air duct system leaks 15 to 20 percent due to faulty coils, filters, drains and compressor fans. By testing these systems regularly and regulating temperature for day and night with a programmable thermostat, your business can save money and power thereby increasing efficiency. Climate Control may sound like a rehash of the efficient heating and cooling conversation, and certainly there is overlap, but we’re mainly talking about clever placement of trees here. Trees and other foliage provide a natural and aesthetically pleasing means of cooling a building down (by a margin of up to six degrees). If your business happens to reside in an area with a cooler climate, then trees can still serve as excellent wind breakers. According to San Diego’s Office of Sustainability, three well-placed trees can save up to 30 percent of a building’s cooling costs not to mention the physiological benefits of consume carbon dioxide consumption and water filtering. This one is a no-brainer. Whenever possible, reduce the amount of consumption in your office by using double-sided printing, recycled packaging, reused inputs, and recycled materials. Also, keep an eye on the rapidly-advancing 3D printers. One day, these miracle machines will revolutionize efficiency and power-saving within the workplace. Posted on September 9th under Renewable Electricity.